Hello and welcome to a new lesson series in which I will be discussing different picking techniques over the course of the next weeks. Not only shall every article offer you a short overview of the importance of the technique being discussed, but also offer exercises and pointers in order to develop it. This first instalment deals with one technique that is essential for most genres of music played on the electric guitar, that is, alternate picking. Acoustic players who are interested in soloing can also greatly benefit from getting acquainted with this technique, as it makes several things not only possible, but also easier. Alternate picking is barely something new. It’s been around ever since instruments such as the Mandolin were developed. Alternate picking is also employed by Balalaika players, as well as Bouzouki players and pretty much by any instrument that require the player to pluck the strings using a plectrum.. Ever since the rise of popularity of the modern guitar, the pick has been automatically associated with it, specially with the electric guitar. Early electric guitar players, however, still used their fingers and it’s hard to tell exactly who was the first mainstream player to employ a pick, much less who was the one to endorse alt picking. 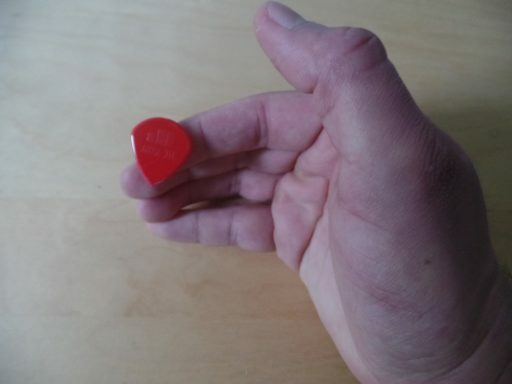 The fact of the matter is that a great number of techniques developed for the electric guitar require you to employ a plectrum. Whether you play every note or choose to use legato in order to spare on pick strokes is up to you. Alt picking is necessary for those wishing to play challenging riffs, as well as really fast solos. The technical advantages posed by alternate picking have made it an essential component of the technique require in the more technical genres of music, such as rock and metal. 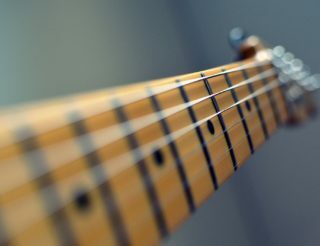 Players such as Paul Gilbert and John Petrucci are commonly associated with these technique, but it was probably Yngwie Malmsteen who popularized the idea of picking every single note, an approach that was most likely inspired by the classical influence on his style. Here is a videos by the master himself explaining the alternate picking technique. The idea behind alt picking is quite simple: alternating downstrokes with upstrokes. In order to make this happen, you need to figure out which picking technique works for you the best. By picking technique I mean the way you position your right hand and the way you hold the pick. 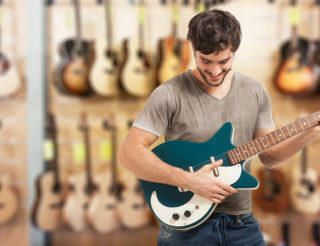 Unlike the classical guitar, the acoustic and the electric guitar allow you to choose your own technique for the right hand. Classical guitar players are expected to hold true to the tradition and position their right hands in a certain fashion, but as an electric guitar player, your right hand technique is only “wrong” if it doesn’t allow you to sound good or achieve a certain level of technical proficiency. In the following photos you can see how I personally hold the pick and the angle at which I hit the strings. Keep in mind that this is what works for me and that each guitar player has his own personal approach to picking. 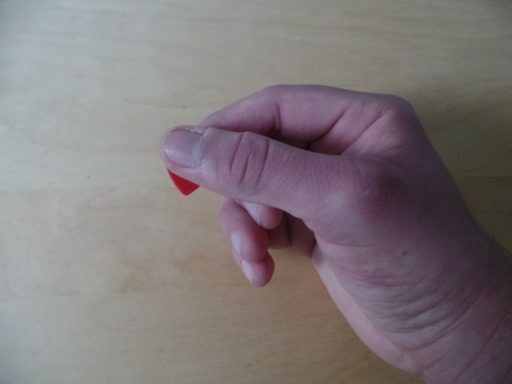 Some general pointers can be regarded as generally good advice, such as not holding the pick too hard in fear that it might slide off or using a pick that is too light and/or prone to break. 1…allow you to play comfortably, with as little tension as absolutely necessary. The only thing I dislike about my own technique is that, it being a mix of elbow and wrist picking, it consumes quite a lot of energy when it comes to playing fast songs or fast lines for a considerable amount of time. This is one of the reasons why I generally avoid playing very fast. Another important aspect related to tension avoidance is the grip of the pick. Lowering your grip will result in more fluid, faster and more accurate playing. 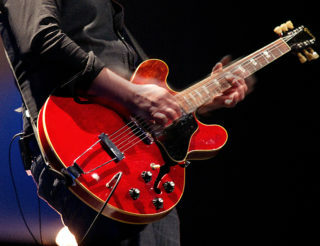 2…allow you to play clean: your technique should allow you to mute unwanted noises such as the ringing of the strings you are not playing or unwanted open strings. For this purpose you’ll employ the lower side of your right hand’s palm. Simply place your the palm on the thicker strings, which are more prone to ring out when not played. Avoid using lots of pressure, as it can alter the tuning of the strings. As far as the angle at which the pick attacks the strings is concerned, I find a forty-five degree angle to work the best, specially for fast playing. It also yields a sharper, less percussive attack and facilitates sweep-picking. Several guitar method books I’ve consulted recommend holding the pick parallel to the strings. Although this position will yield a warmer, fuller sound, it will also prove difficult to maintain when standing up, or when playing challenging stuff. Whether the “free” fingers of the right hand should be resting on the guitar’s body or floating in the air is yet another question that may confuse the already clueless beginner. I believe anchoring can result in more stability of the picking hand at high speeds, it will reduce unnecessary motion, allow for more controlled string-skipping and will improve sweep-picking moves. The only downside of anchoring is perhaps less flexibility when it comes to hybrid picking. Again: it is important to keep in mind that whatever works for your favorite guitar players may not work for you. Consider the fact that pretty much the majority of players ends up with a technique they themselves came up with and which often differs from that of their teachers. Consider how different Steve Vai’s picking technique is from Joe Satriani’s. Paul Gilbert and Buckethead, however, have a very similar, almost identical approach to picking. This article wouldn’t be complete without exercises for you to develop a precise, clean picking technique. These exercises are rather boring from a musical point of view, but they will help you develop a solid foundation for more difficult stuff. Our first exercise is meant to be played at a moderate, steady tempo. Use a metronome for this and aim for accuracy, good tone and staying in tempo. Feel free to explore with the placement of the pick and the position of the hand on the strings. You will realise how small modifications have big repercussions on your performance. The second exercise will have you practicing accuracy and palm-muting at the same time. Speed is not something you should be thinking about. That comes later. Pay close attention to the range of motion used. You want rather small movements, and stay in the beat. The third and final exercise is an extension of the one above. Now we’re going to work on synchronising both hands. This exercise serves different purposes. It is a great warm-up routine before a show or a practice session. 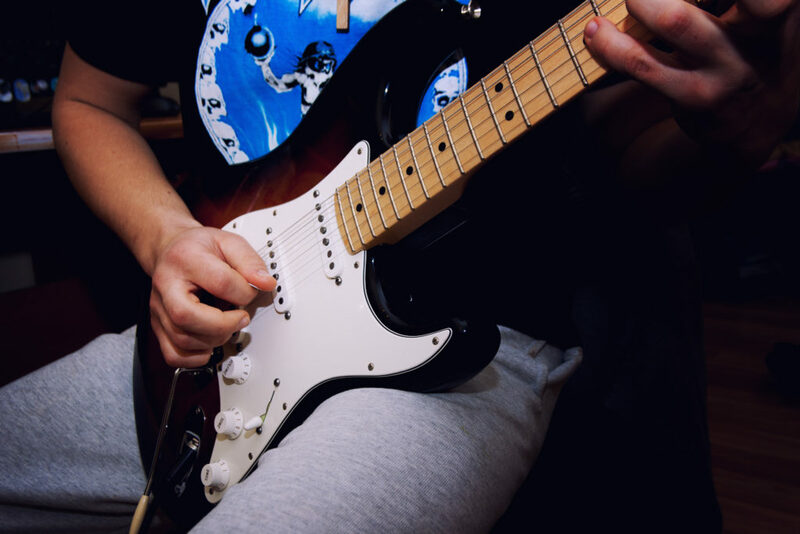 It is also a great way to train yourself to employ economy of movement (keeping your fingers close to the fretboard) as well as strengthening the left hand’s pinky. This article was hopefully informative and helpful enough for you. I will be discussing other details relevant to this technique in a future article. For now, stay tuned for the next instalment of these technique series, as I will be talking about a technique that both fascinates and intimidates guitar players: sweep picking.